The Brazilian Aluminum Association (ABAL) and the Brazilian Association of Highly Recyclable Cans Manufacturers (ABRALATAS) report that in 2014 the country recycled 289,500 tons of aluminum beverage cans out of the 294,200 tons available in the market, a growth of 12.5% over the previous year. 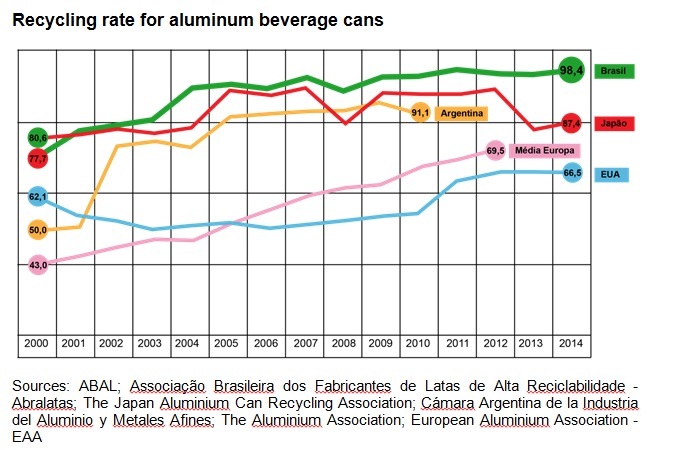 Thus, the recycling rate for aluminum beverage cans reached 98.4%, keeping Brazil as the world leader since 2001. According to data of the two entities, 22.9 billion of packs were recycled last year, which corresponds to 62.7 million / day or 2.6 million/hour. In 2014 alone, collecting aluminum beverage cans injected R$ 845 million in country´s economy, thus contributing to generating income and jobs for thousands of waste pickers. Moreover, the recycling activity consumes only 5% of electrical energy, when compared to the primary metal production process. This means that recycling 289,500 tons of cans in 2014 allowed savings of 4,250 GWh/year for the country, a figure that corresponds to the annual residential consumption of 6.6 million people in two million homes. An analysis on the beverage aluminum can lifecycle in Brazil, an unpublished study by the Packaging Technology Center (CETEA), has confirmed the advantages of this packaging for the environment. According to that survey, recycling aluminum cans for obtaining a new package reduces C02 emissions by 70% and energy consumption by71%, among other benefits, when compared to cans made only with primary aluminum.